I hope you are having a great week. It’s chilly here but I have been keeping my fingers busy by doing some crafting. 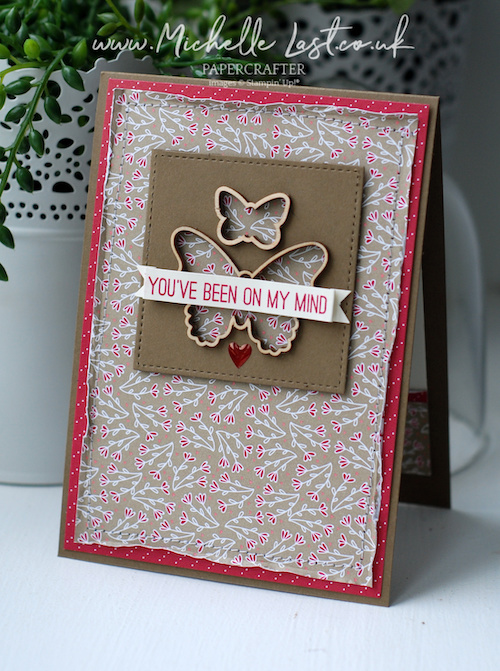 I used the Wooden Buttefly Elements from the Sale-a-Bration brochure which are free with a £45 order. There are lots of free items to choose from, there are some real beauties. You can see all the free Sale-a-bration items here. 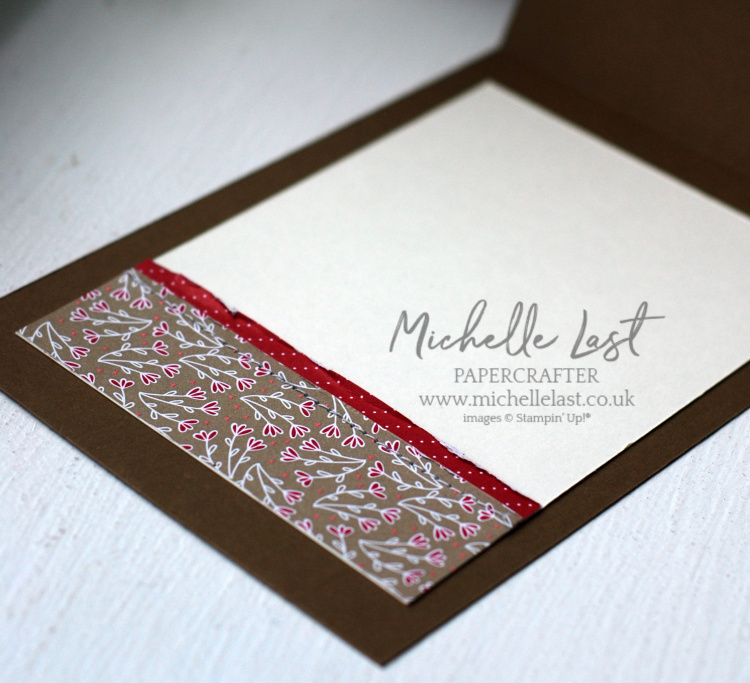 We have some beautiful patterned paper in the new Spring Summer Catalogue and I got my sewing machine out and added the pretty layer to the card front using a running stitch on my machine. 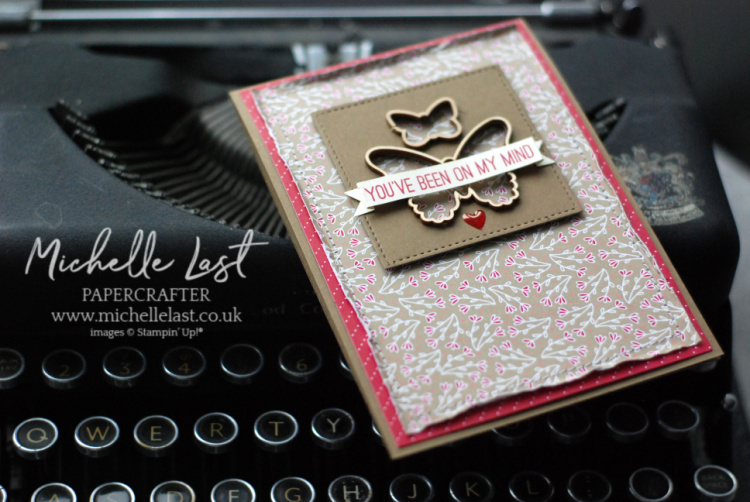 The paper is called All My Love Designer Series Paper and its lush! I punched out the butterflies from the Butterfly Duet Punch on a piece of Soft Suede Cardstock and then die cut a square from the Stitched Shapes Framelits. The wooden butterfly elements fit the punch shapes so I simply add a little tombow to the edge and stuck them to the edge of the punch outs. The greeting is from the Butterfly Gala stamp set which coordinates with the Butterfly Duet Punch. If you purchase the two together in the bundle you get 10% off. The Epoxy Heart Droplet is coloured with Lovely Lipstick Stampin’ Blends. I roughed up the edges of the designer series paper to give a distressed/aged finish. I have decided that I will decorate the inside of my cards to match the outside. That is one of my new goals for 2019. I hope you like it. 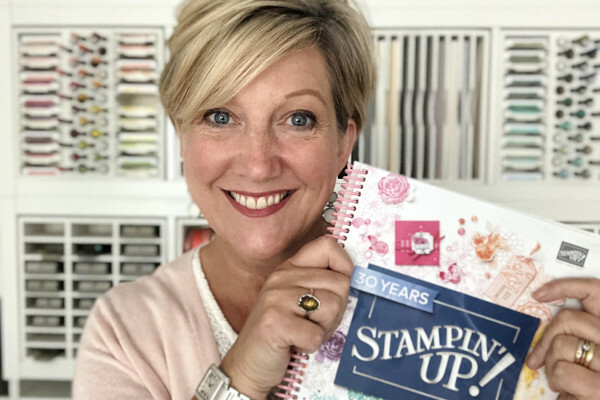 If you would like to purchase any of the items from our Stampin’ Up! catalogues they are available from my online shop. During sale-a-bration (which runs till 31st March) for every £45 you spend you can choose a free item from the Sale-a-bration brochure. It is the perfect time to treat yourself to some new crafting goodies and get extra for free! All the items I used are shared below. Simply click any of the images to go direct to that item in my shop and place an order. Please do not forget to use the monthly hostess code when spending £20+ (and less than £150) to receive a free thank you gift. Everyone receives a handmade card for shopping with me as I really appreciate you supporting my business. Please get in touch if there is anything I can do to help. Have a great evening! “The wooden butterfly elements fit the punch shapes” -ooh, that’s good news! Beautiful card, love stitching on paper. I’ve been thinking about decorating the insides of cards more… and envelopes.